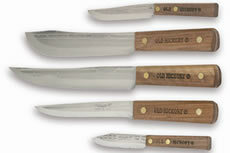 Ontario Knife's "Old Hickory" knives have stood the test of time and proved themselves as the best carbon steel kitchen knife sold today. Each "Old Hickory" knife is made with 1095 carbon steel, fully heat treated and tempered to provide a razor sharp cutting edge which is easily sharpened when needed. Rada Cutlery is made of surgical quality, T420 high carbon stainless steel. Their permanently cast solid satin-finished aluminum handles create a "feel good in your hand" balance for superior comfort.